Egypt’s first independent May Day celebrations ended early today after dozens stormed the event’s main stage. 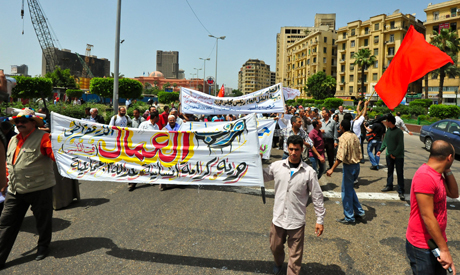 The celebration organised in part by the Egyptian Federation of Independent Trade Unions (EFITU) took off around midday as different initiatives, parties and representatives from newly formed independent unions took their places in Tahrir Square and hung their banners, readying themselves for the day’s events. Representatives of the Workers’ Democratic Party (WDP) alongside members of the Revolutionary Socialists and various unionists marched from Talaat Harb Square to Tahrir Square, chanting, “A workers’ revolution against the capitalist government.” Various voices called for renationalisation while others called for setting a minimum and maximum wage. However, the evening’s main events, which were to be held on the EFITU’s central stage and were to include speeches by union figure heads, poetry readings and a musical performance by Ali El-Haggar, ended in an ugly manner. Soon after speakers began to take to the stage, dozens of people, demanding an end to the celebrations, forced their way onto the stage. The crowd, cursing and pushing their way through shocked bystanders, began yelling “Go away, go away” and “How can you celebrate when martyrs died here?” as they jumped on stage and began dismantling sound and light equipment. Kamal Abou Eita, head of the Independent Union for Real Estate Tax Employees, and Kamal Abbas, head of the Centre for Trade Union and Workers’ Services (CTUWS), were among the union leaders forced to leave the stage. Abou Eita made several attempts to bring focus back to the now chaotic crowd. Chanting against de-facto leader Field Marshall Mohammed Hussein Tantawi and for the release of political prisoners could be heard from elements of the gathering mob. Groups of inquisitive onlookers came to discover the source of the turmoil though no general consensus could be reached as to the identity of the new arrivals. After the situation reached its high point, military police began to occupy the stage while even more walked through the hundreds still gathered, attempting to disperse them and force through oncoming traffic. Today’s celebrations saw representatives from many groups, including the Socialist Popular Alliance (SPA), the Popular Committees for the Defence of the Revolution, a small gathering of anarchists, the Wafd Party, and various independent trade unions. The presence of workers, however, was hardly felt. While unionist figures from various industrial sectors came to celebrate, the anticipated presence of tens of thousands of workers was nowhere to be seen. A Mahalla textile worker stated that the industrial centre would hold another celebration for the workers on 5 May. In addition to lacking any significant presence by Egypt’s millions of workers, the events were light on the commemorations generally associated with International Workers’ Day (or May Day). International Workers’ Day, established as annual event in 1891 during the Second International’s second congress, was organised to commemorate and recalls the sacrifices made by workers. The date was chosen to highlight the anniversary of the “Haymarket affair” which took place five years earlier in Chicago. The international workers anthem, or the “Internationale”, which has been translated into many languages, including Arabic, was also not to be heard. Nevertheless, spirits earlier in the day were high as thousands of activists and unionists called for “Dignity, Freedom and Social Justice.” The most voiced demands were those for the restructuring of wages, the trial of corrupt union heads and legislation that would legitimise the formation of new independent trade unions.